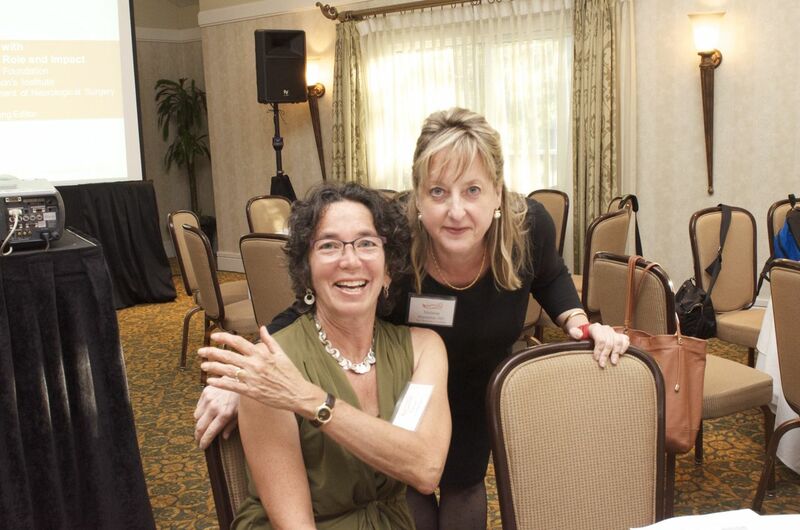 Dr. Melanie Brandabur, right, and Parkinson’s Women Support member Elaine Sulzberger at a recent Parkinson’s Disease event. November 12, 2014 | by Darcy Blake | Dr. Melanie Brandabur, M.D., MDS, former Clinic Director at Parkinson’s Institute in Sunnyvale, has accepted a position at Ultragenyx in Novato as a Medical Director. The clinical-stage biotechnology company is committed to bringing to market novel products for the treatment of rare and ultra-rare diseases, with an initial focus on serious, debilitating genetic diseases. She will be helping to develop clinical trials for new drugs, among other things. Dr Brandabur is hoping to eventually have a monthly PD clinic in the San Francisco area. Watch this blog for more information. Dr. Brandabur, received her BA degree from the University of Illinois in Urbana and her MD degree from Rush Medical College in Chicago. She completed her neurology residency at Rush-Presbyterian-St. Luke’s Medical Center in Chicago. While there, she completed a Fellowship in Movement Disorders and Pharmacology under the direction of Doctors Harold Klawans and Christopher Goetz. With over 20 years of experience caring for patients with PD and related disorders, her philosophy of patient care incorporates a multidisciplinary approach to PD treatment, with a emphasis on exercise and nutrition. She lectures frequently on aspects of PD including complementary therapies, cognitive issues and nonmotor symptoms. In 2008, she introduced a group of women with Parkinson’s disease to each other, and they formed a vibrant support group called Parkinson’s Women Support. Their mission is to offer moral support, encouragement and camaraderie for women who are Parkinson’s Disease patients. The group has an audience of over 400 on Facebook and a blog titled http://parkinsonswomen.com. Dr. Brandabur has often stated that the group that developed as a result of her idea to introduce the founding members to one another has been one of her most fulfilling accomplishments. Last year, the group presented her with a book titled To Dr. Melanie Brandabur that included tributes from many of her professional peers around the country, and her patients. This selection of excerpts from her patients’ quotes describes her unique gifts as a healer. Dr. Brandabur will be deeply missed by the Parkinson’s community, and her years of specialized medical training, and dedication to patients with Parkinsons’ Disease will be difficult to replace. We wish her the best of success in her new research endeavor.